Genre Practice® is the one-of-a-kind writing program at UAGC, an integral part of the Learning Cultures® model developed by NYU Professor Cynthia McCallister. It is one of the most important aspects of our culture of learning, and has opened writing opportunities, like Girls Write Now, for countless students. Every student takes a writing workshop class, every semester, to develop their own author's voice and intentions. Explore the many genres students experiment with, as they develop their writing intentions and collaborate with others to make these come to life. Kariyma's Prose Poem: Can You Tell? Class Coggle: What's Love Got To Do With It? Paloma Paredes Jaquez sat down with a current Keepers of the Culture (KOC) member who has a Promise Card of his own. Jazmin Guzman's News Site: Is the Government Lying to Us? 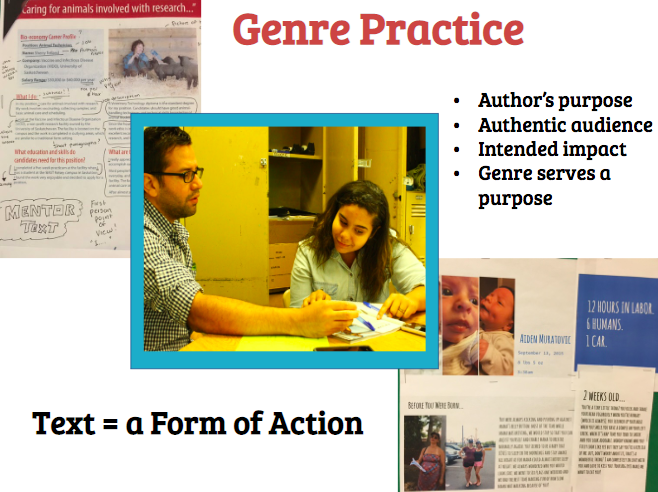 Genre Practice®, in our writing workshops, is a foundational part of Learning Cultures®. Student intentions are developed through Primary Genre Writing, a sort of brainstorming before a genre is chosen. This regular, foundational writing is then developed into final pieces for publication. Every student has regular one-one conferences with their writing instructor, and every student shares their in-process writing regularly with the entire class. The graph below shows the growth in writing fluency we see in students year after year. Allowing students to pursue their own intentions, while collaborating with others to grow stronger, allows for growth beyond expectation.